Combining a professional grade table with easy portability, the Aces Pro from BBO Poker seats up to 11 (10 players and 1 dealer), folds down for easy storage, and comes with ten 4-inch stainless steel cup holders. It features a dealer cutout for a professional poker experience (dealer tray sold separately) and a faux leather vinyl armrest that's both easy to clean and removable for quick surface upgrades. The table has a reinforced wood frame and 1.2mm heavy duty steel tube folding legs that won't separate when the table is put under horizontal stress. The Aces Pro offers a choice of two playing surfaces -- poker felt or water-resistant suited speed cloth (a smooth polyester weave fabric that provides faster card slides). The table measures 96 x 48 x 30 inches (LxWxH). 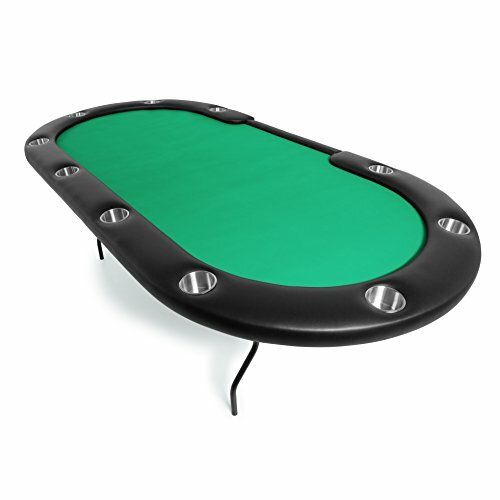 BBO Poker Tables manufactures stylish, high quality poker tables and game night tables for players who demand a premium showpiece at an affordable price. All tables are upholstered in California. In 2015, BBO Poker Tables was named the official poker table supplier of the World Poker Tour. View More In Game Tables. If you have any questions about this product by BBO Poker, contact us by completing and submitting the form below. If you are looking for a specif part number, please include it with your message.